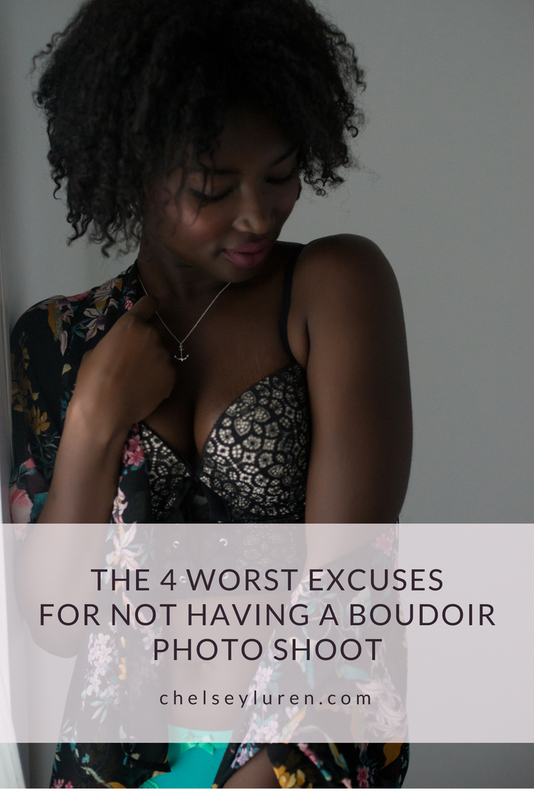 The 4 Worst Excuses For Not Having a Boudoir Photo Shoot | Vancouver Boudoir Photography — Chelsey Luren Co. Okay, those aren't excuses that I hear often. But are used to drive the point home that the majority of reasons people give for not doing a boudoir photoshoot are really pretty lame. 1. " I need to lose weight / get in shape first"
I hear this excuse so often! Boudoir photography is about body acceptance and celebrating who you are, as you are. Aside from that, there are also a number of solutions: Picking outfits that flatter your figure is a must. But even more than the outfits are the poses, the anglesI shoot from and great natural light. 2. " I don't have a significant other"
Although boudoir photography does make a fantastic gift, a boudoir photoshoot is more importantly about you and you alone. A boudoir session is something that every woman should experience at least once in their life. The confidence boost felt after a luxury boudoir photoshoot one that should really be felt for yourself and not anyone else. 3. " I have no idea what to do"
That is perfectly fine! Most of the women I photograph this is their first experience with a boudoir photoshoot. Because of that, I am there to direct and coach you every step of the way. You will never have to worry about how to pose, or move, or what expression to make, or where to place your hands or anything else. I will never leave you hanging and wondering what to do. You're in good hands. 4. " I don't know what to wear"
Every woman’s ideal lingerie outfits vary from one person to the next. Some women feel amazing in a tank top and undies, for others a bustier and stockings are a better match. What matters the most is how you feel in what you are wearing, so bring what makes you feel beautiful. DuringWe will sit down to discuss outfits in your pre-shoot consultation. So stop worrying, you won't be saying this. So it’s time to stop giving excuses and book your boudoir session. Book your free consultation by emailing info@chelseyluren.com or call/text 778-385-2225. I can’t wait to be able to capture amazing images of you that you will cherish for the rest of your life!